Biochemical engineer Bruce Dien and microbiologist Loren Iten use mini-batch reactors to pretreat biomass at high temperatures to prepare it for fermentation to ethanol. Here, they are pretreating corn fiber, but the process is the same for switchgrass. At the Agricultural Research Service’s Bioenergy Research Unit in Peoria, Illinois, field work and bench investigations keep ARS scientists on the scientific front lines of converting biomass into cellulosic ethanol. For instance, one recent research focus has been on determining how switchgrass plant maturity at harvest affects ethanol yields. Chemical engineer Bruce Dien led a study that evaluated samples of two different switchgrass varieties that were harvested at three different points in plant development and then pretreated with diluted ammonia. This approach is similar to a treatment used sometimes for enhancing forage quality. Dien’s team observed that even though plant glucose and ethanol conversion efficiencies decreased as the plants matured, overall ethanol yields were relatively consistent—between 176 and 202 liters per metric tonne (42 and 48 gallons per ton) of biomass. After evaluating the different yields obtained from the two varieties, the scientists concluded that biomass producers could optimize ethanol production from their crops by planting the variety Kanlow—a lowland switchgrass type—and harvesting either at midseason or after a frost. Results from this study were published in Environmental Technology in 2013. Chemist Michael Bowman led another study that focused specifically on switchgrass xylans. Xylans are polymer chains composed primarily of the sugar xylose. Bowman studied xylan levels at three different stages in switchgrass development to see whether xylan structures change as the plant matures. Bowman determined that structural features of xylan remained the same throughout different stages of maturity, even though the amount of xylan differed from one stage to another. This is good news for biorefiners because it suggests that they can use the same enzyme mix to break down xylans for all switchgrass biomass, no matter when the crop is harvested. Results from this study were published in Metabolites in 2012. Molecular biologist Ron Hector, meanwhile, led work on the microorganisms needed to ferment xylose into ethanol. Xylose is more difficult to convert to ethanol, compared to glucose. Scientists already knew that an enzyme called “D-xylose isomerase,” or XI, is one of several enzymes required to convert xylose into ethanol. But, to date, it has been difficult to harness XI’s conversion potential because of the difficulty of expressing XI in yeast strains and other technical issues. However, Hector and his colleagues isolated the XI enzyme from several different rumen and intestinal bacteria and used them to engineer yeast strains that were able to ferment xylose into ethanol. Then they took the most promising yeast strain from this first round of trials—which contained the XI enzyme from the rumen bacterium Prevotella ruminicola—and improved its growth and fermenting capacities through further adaptations. The result was a yeast strain that grew almost four times faster than other strains that contained XI enzymes and could produce ethanol at significantly greater yields than other yeasts engineered to ferment xylose to ethanol. The scientists published their findings in Biotechnology for Biofuels in 2013, and a U.S. patent was recently issued for the XI enzyme described in this article.—By Ann Perry, Agricultural Research Service Information Staff. 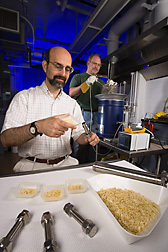 This research is part of Biorefining, an ARS national program (#213) described at www.nps.ars.usda.gov. To reach the scientists mentioned in this story, contact Ann Perry, USDA-ARS Information Staff, 5601 Sunnyside Ave., Beltsville MD 20705-5128; (301) 504-1628. "A Steady Pace of Cellulosic Ethanol Research in Peoria" was published in the October 2014 issue of Agricultural Research magazine.